Is It Time for Responsive Email Marketing Design? Guest post by Tiffany Edwards, Account Manager at emfluence, a full service interactive marketing company based in Kansas City. Computers, tablets, mobile devices and oh-so-many more! How can we ever make websites and emails look great and function well on so many devices? Many marketers are turning to something called responsive design. With responsive design, the email or webpage will automatically resize images, text and tables based on a user’s screen or browser width. 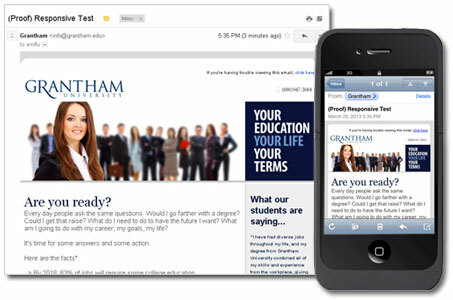 Grantham University’s email resizes text and drops the right column when a subscriber views on a mobile device. Responsive design detects a user’s screen size using a CSS media query to determine the width of the screen being used. Then, the website or email code applies specific style rules (CSS) to fit the design elements to the screen size. Of course, it’s much simpler on websites since there are only a handful of different browser types compared to more than 30 different email clients. If you’ve talked about or used CSS in email design in the past, you may be wondering: Can responsive design work with email marketing since it uses CSS styling? Unfortunately, it’s not a simple yes or no… And it’s likely to take your email team a bit of time to figure it out. The big question: Is it worth the investment?